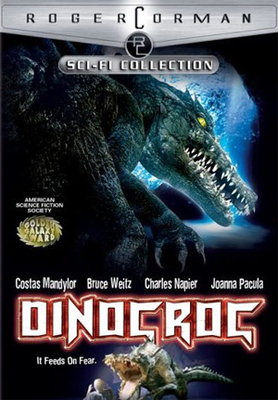 DinoCroc, produced by Roger Corman, directed by Kenin O'Neill and starring the late, great Charles Napia, Joanna Pacula and Jake Thomas, better known for his portrayal of the character of Matt Mcguire on Disney's Lizzie McGuire, making for a fun and sometimes rather disturbing B-grade "death from the deep" film, which has found itself a huge cult following and won itself an American Science Fiction Society Golden Galaxy Award. It has since spawned itself both a sequel and a prequel. After a prehistoric dinosaur ancestor of modern day crocodiles is found in Africa, a secret research lab uses its DNA to create super prototypes of the creature, but, as in all "death from the deep" films, something goes horribly wrong. One of the creatures attacks and kills a researcher and is put down and just when everyone thinks that's the end of that chapter, they find that another has escaped into the wild of the surrounding swampland and the owners of the lab want to keep it a secret, but its hard keeping a giant man-eating DinoCroc a secret for very long. When Diane Harper, the county dog catcher, endeavours to help her ex-boyfriend find his kid brothers missing dog, Lucky, after she believes it was stolen, they find themselves in a life and death battle to uncover the labs evil doings, destroy the killer mutant crocodile and not only save theirs and the town members lives, but to save the lives of the k-9 population who are being used by the lab's henchmen as bait, in order to re-capture the massive and very hungry DinoCroc. DinoCroc is an exciting "death from the deep" film, with plenty of amusing dialogue, great acting, nasty gore and one surprisingly disturbing scene, you won't see coming. DinoCroc is rated MA 15 for medium level violence and was originally released on DVD in 2005. Check out Piranha Piranha (1972), Piranha (1978), Shark, Swamp Shark, Devil Fish (Monster Shark), Jaws 5: Cruel Jaws, Sand Sharks, Jurassic Shark, Malibu Shark Attack and if you're looking for one suitable for the kids, Ice Age 2: The Meltdown. Why? For fans of killer animal & dinosaur films!